This 2 bedroom villa is located in Palau and sleeps 5 people. It has WiFi. The villa is within walking distance of a beach. House attached to another house, 4 - 5 people, 3 room/s, 2 bedroom/s, 2 bathroom/s, approximately 65 m², 2 floor/s, year of construction 1993, renovated 2011, separate access to the property. Feature: Property in a residence (36 units in total). Furnishing: pleasing, well-kept, tiled floor. Equipment: satellite TV; internet access Wi-Fi (included); washing machine; no heating option; storage room. € 21 per person and week (depending on occupancy) plus Holiday resort tax. Linen/towels must be brought along. Bed linen and towels available on loan, € 20 per person/​change (on order). Deposit € 250 (in cash). Cot € 30 per stay (on order). Pet 2 animals allowed, € 30 per pet and stay (please advise prior to arrival). Situation: suburbian area Palau, holiday village, sea view, view of La Maddalena. 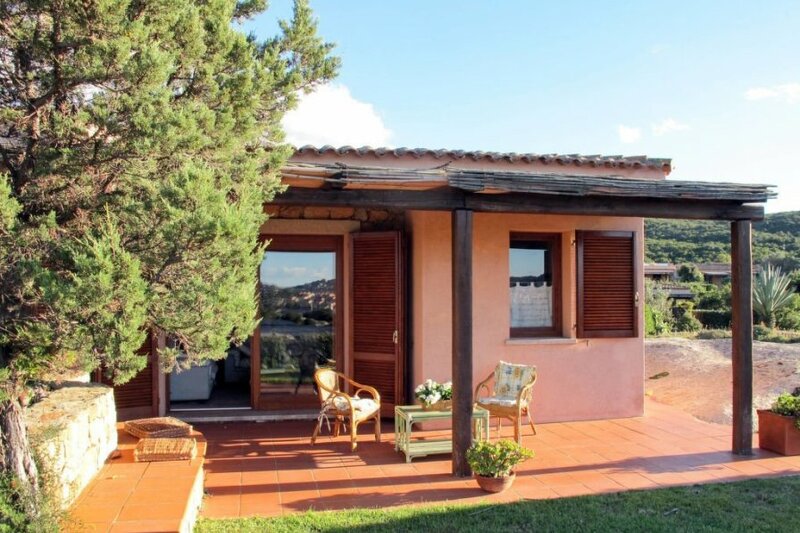 Estate (private use): approximately 500 m², partially self-contained (fence, hedge), in a hillside, trees, lawn, rocky. Garden maintenance by the gardener 2 time/s per week. Outdoor facilities(private use): terrace (with bast top), terrace (with bast top), terrace (with bast top), furnishing provided, 2 sun loungers, brick barbecue. Plot description: 1 x car park approximately 70 m (roofed). Access to the house via footpath approximately 20 m (4 steps). The agent describes this villa as a family friendly holiday rental ideal for the summer holidays. For younger guests there is some vibrant nightlife not too far away. It is also good value for money. This villa is located in Palau. The nearest airport is only 46km away. It is set in a very convenient location, just 0 metres away from a beach and only 800 metres away from the city center.